UniFirst scraper mats feature specially designed cleats that scrape shoes clean of their heaviest soiling. 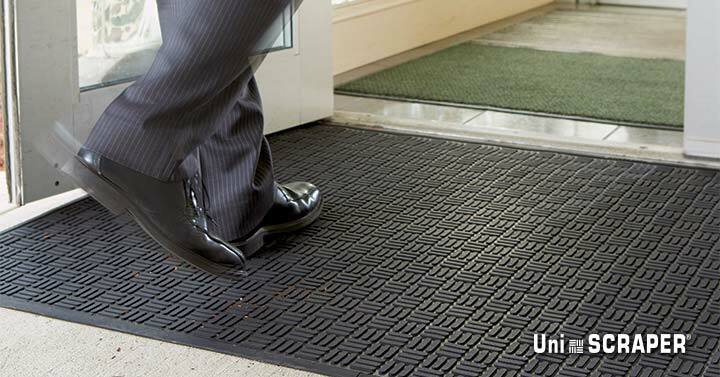 When placed outside entrances, our proprietary rubber scraper mats help prevent outdoor mud, debris, and moisture attached to footwear from entering your facility. The secret to their dirt-grabbing effectiveness is molded, raised bidirectional cleats that effectively scrape shoes clean. Made of heavy-duty 100% nitrile rubber with stay-in-place waffle backing, these mats withstand the harshest use, yet retain their effectiveness. UniFirst rubber floor mats are oil and chemical resistant, also making them suitable for kitchens, locker rooms, auto repair bays, manufacturing areas, and other demanding commercial work environments. And with a full-service UniFirst floor mat rental program, you receive regularly scheduled laundering and replacement services , so you can be assured your UniScraper rubber floor mats will perform 24/7/365. Learn more about our UniScraper scraper mats in the UniFirst Facility Services catalog or browse our complete line of commercial floor mats online and add items to your quote cart to request a proposal that includes regular mat cleaning and delivery. We also offer complete UniFirst floor mat rental services for entrance mats, message, photo, and logo mats, “wet area” mats, and anti-fatigue mats.